Spirometry is a simple, painless evaluation of lung functionality that helps determine the extent of breathing problems. A spirometer measures the amount of air you inhale as well as the amount and force of the air you exhale. All you have to do is take a deep breath in and then exhale as hard and as fast as you can into the spirometer. An analysis of your breathing will then be generated and recorded. AAIR can provide you with all the spirometry equipment you need. 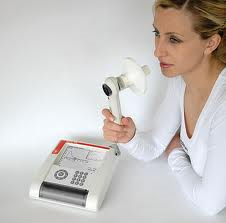 How Can Spirometry Benefit Me? Spirometry is a fantastic way of diagnosing lung and breathing problems. This can indicate if you will benefit from the use of a bronchodilator (breathing machine) or related treatment. A spirometer also shows if lung and breathing treatments are effective, as patients and doctors are able to measure change on the spirometer. If you have breathing problems, come see the lung experts at AAIR. We will examine your condition and help you decide if spirometry can improve your lung capacity. You don’t have to live with debilitating asthma or shortness of breath. AAIR can help you get control over these conditions so you can breathe easily again.